Oaklawn Park (photo via Youtube). Top winter dirt racing is ready to return to the Midwest with the opening of Oaklawn Park on Friday, Jan. 25, for a meet that has been extended three weeks past the track’s usual mid-April closing date — to Kentucky Derby Day, Saturday, May 4. Freezing temperatures in January usually mean a slow start to the season, but as the weather warms up, so does the quality of racing and wagering at Oaklawn. The best part of the meet comes mainly over the course of March and April. Oaklawn Park features one of the country’s best 3-year-old stakes programs, as the track marches on through winter and spring to Arkansas Derby Day, which, this year, will be on Saturday, April 13. Oaklawn’s pathway to the Kentucky Derby wastes no time kicking off, with its first prep — the $150,000 Smarty Jones Stakes (G3) at one mile — headlining the opening day card. That will be followed by the rest of the prep race schedule, including the $500,000 Southwest Stakes (G3) on President’s Day (Feb. 18), and the $1 million Rebel Stakes (G2) at 1 1/16-miles on Saturday, March 16 leading up to the $1 million Arkansas Derby (G1). The Arkansas Derby is the centerpiece of the track’s “Racing Festival of the South” that takes place April 12-14. It features five graded stakes, including the Oaklawn Handicap (G2), the Apple Blossom Stakes (G1), the Count Fleet Sprint (G3) and the Fantasy (G3) for 3-year-old fillies. The 3-year-old stakes scene at Oaklawn Park usually gets a major boost each year with the constant presence of Bob Baffert, who ships in regularly from California with prime contenders for the Southwest, Rebel, and Arkansas Derby — such as he did with eventual Triple Crown winner American Pharoah and so many others. Expect more of the same this year, especially with the purse of the Rebel raised to $1 million this season. Oaklawn Park generally does not get the notoriety of the other key winter meets from around the country, due in large part to the fact that Oaklawn does not have a turf course. Nevertheless, the day-to-day dirt racing at Oaklawn — featuring big fields and good betting races — is nearly on par with other tracks running at this time of year, especially in the midwest. Handicapping at Oaklawn Park has its nuances and it pays to pay attention to the daily happenings at the meet. 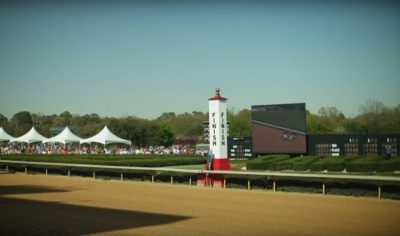 While the racing surface is mostly regarded as fair at Oaklawn, the track does have some prevailing biases to watch out for, in addition to some occasional track biases that tend to pop up here and there in terms of inside or outside paths, or various running style biases, as the weather tends to change track conditions from day to day. The Oaklawn dirt course is a one-mile oval with two different finish lines — the traditional finish line and an alternate finish line at the sixteenth pole, which serves as the finish for one-mile races. This makes the run-up into the first turn longer at a mile and, therefore, lessens the disadvantage to outside posts. The second finish line has, in fact, made a big difference for Oaklawn horseplayers in one-mile races, raising the overall success rate for middle posts and making outside gates nearly equal to inside posts, which, in the past, had been advantageous nearly all the time in Oaklawn routes. Inside posts, and particularly the rail, are generally still good at all distances, especially at six furlongs. The drop-off from inside to outside posts is not really as dramatic as it used to be at Oaklawn at the other distances, especially in one mile races. Now, the rail and inside posts are much more effective at 1 1/16 miles. At one mile, however, the middle posts (4-7) are preferred. 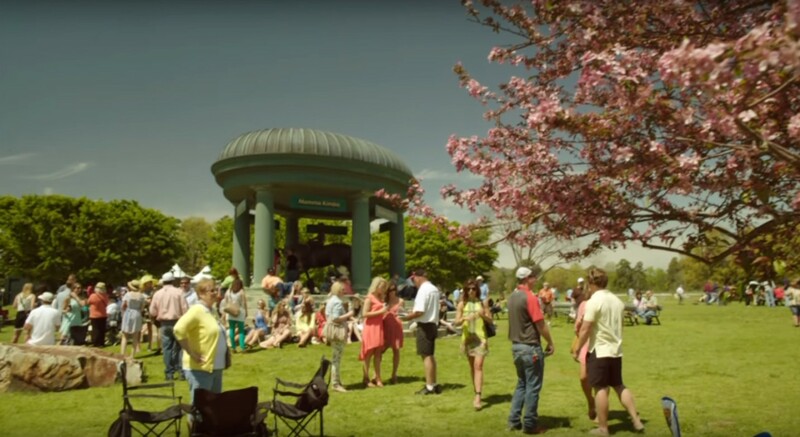 Beautiful Oaklawn Park (photo via Youtube). If you are using post positions to help you narrow down the fields when handicapping Oaklawn, it would be a good idea to combine post position preferences with a careful eye on the track’s changing prevailing biases. At OP, the tried-and-true prevailing running-style bias is for horses with early speed — or at least tactical speed, that can stay within two lengths of the early lead. Due to the one-mile Oaklawn track layout and relatively short stretch run in comparison to other tracks (and an even shorter stretch run at one mile), Oaklawn always has been this way — and probably always will be to some degree. Early-speed horses that race on or within two lengths of the early lead have the preferred running style at each of Oaklawn’s three most commonly-run distances — six furlongs, one mile and 1 1/16 miles. According to stats from the 2018 Oaklawn meet, six panels was the kindest to frontrunners, which enjoyed a 30 percent winning percentage at that distance. The seldom-run 5 ½-furlong distance was even more speed-favoring with five of 13 winners (38 percent) going wire-to-wire. Meanwhile, 23 percent of all one-mile races were won wire-to-wire and 28 percent of the races at 1 1/16 miles were won wire-to-wire. The dominating humans to focus on at Oaklawn Park tend to be STEVE ASMUSSEN in the trainer’s race and RICARDO SANTANA JR. in the jockey standings. Both won their respective titles again in 2018 after also enjoying highly successful meets in 2017. Asmussen earned his ninth trainer title with 44 wins in 2018 and can usually be counted on for at least that many victories after clicking for 41 wins in 2017 and 46 — to go along with an Oaklawn record $3,448,729 in earnings — in 2016 (thanks in part to Creator’s win in the Arkasnas Derby that year). Ricardo Santana, meanwhile, earned his sixth straight riding title in 2018 with 69 wins, which was a good season by any other yardstick but his own after having won the 2016 riding title with a startling 80 victories and $4,064,073 in purses — also an Oaklawn record. In 2017, Santana was coming off a relatively down year for him with 53 wins, still enough for the title. Both Asmussen and Santana form a deadly trainer/jockey combination and should be able to, once again, lead the way on their respective leaderboards throughout the Oaklawn season. The new man on the scene in the Oaklawn jockeys standings this season will be Joe Bravo, who will move his tack here instead of Gulfstream Park, where he’s spent recent winters. It certainly will add to the overall quality of Oaklawn’s jock’s room to have Bravo riding regularly all season. And while he no doubt will make his presence felt, it is unsure whether he will be able to challenge Santana for the title or even approach David Cabrera for the second spot in terms of winners at the meet. Cabrera was runner-up in the Oaklawn jockeys’ standings last season with 43 wins. He then went on to be the second-leading rider at Prairie Meadows before winning the meet riding title last fall at Remington Park. Overall, Cabrera ranked 11th nationally in wins in 2018 with 236 and he, along with Santana and Bravo, should comprise the top three slots in the jockey standings this season. Santana’s old Oaklawn Park nemesis Ramon Vazquez can no longer keep up with Santana in terms of wins, but should win enough races to hang around in the top five in the standings. In 2016, for example, Santana battled it out all season with Vazquez, who finished only 6 wins behind with 47 victories. Last year Vazquez dropped to fourth in the standings with 34 wins. Former Oaklawn up-and-comer, Alex Canchari, who won 45 races at the 2017 meet, won only 25 times in 2018, good for seventh in the standings. He should do about the same again this year. In the trainer standings, Asmussen was again Oaklawn’s leading trainer in 2018, when he won 44 races, which was 12 races more than the next-leading conditioner, Robertino Diodoro, who finished second in the standings for the second year in a row. Diodoro started to become a major factor at Oaklawn three years ago when he won 22 races from 70 starters for a giant 31 percent win percentage. He followed that up with a big 31-win season at Oaklawn in 2017, including big numbers in terms of winning rate (25 percent) and ITM percentage (52 percent). Former Oaklawn leading trainer Chris Hartman continued his decline locally last season by finishing sixth in the trainer’s standings with 18 wins. He finished a distant second to Asmussen in the 2016 trainer standings and, before that, had been 2015’s leading trainer at Oaklawn with very strong numbers (129-34-21-14, $1.1 million, 26 percent/53 percent). Hartman was only average in 2017, however, winning only 21 times with just an average win percentage (16 percent) and ITM percentage (42 percent). Who will be the best alternatives to Asmussen and Diodoro for bettors at Oaklawn this season? My money will be on Brad Cox, who was fourth in in the 2018 standings with 27 wins and third in the 2017 trainer’s standings with 26 wins, which he accomplished with only 94 starters to lead all major trainers at Oaklawn with a 28 percent win percentage. His ITM percentage can also be counted on to be very good, at around 50 percent. Federico Villafranco is also another good bet based on the fact that he is extremely consistent at Oaklawn. He won 20 races in 2018 after compiling nearly identical 22-win, 17 percent-win percentage seasons in both 2017 and 2016. Ron Moquett is coming off of a very strong 28-win showing at the 2018 Oaklawn meet and will have a similar string of horses based locally again this season. Two other trainers to take note of this season at Oaklawn will be Larry Jones, who will be returning to action with a small 15-horse stable of mostly young horses that should be counted on to win at a high percentage, and Hall-of-Famer Nick Zito, who will be a newcomer to Oaklawn with a string of 20 horses this winter. There are more than three months of great racing ahead at the annual Oaklawn Park meet, so there will be plenty of time for to get your slice of the pari-mutuel winnings. Best of luck, and enjoy the meet at Oaklawn!